A bit sick and tired of this ‘showering’ lark? Us too. Options are in short supply. We could opt out of body hair, because nothing is more soul destroying than a cold, wet barnet. Maybe all bathing could be done in a roasty toasty wetsuit, swiftly eradicating the kerfuffle of towel drying - or perhaps avoid hygiene all together - but this would likely incur unwanted odours and friend loss. 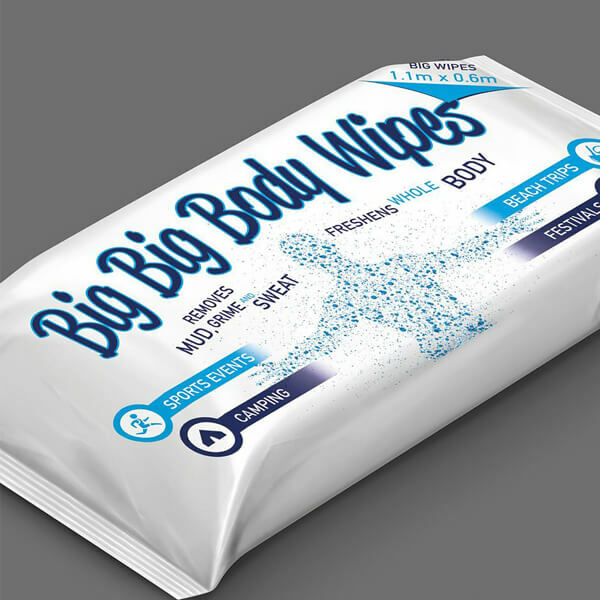 Swiftly arriving on the scene to spare us from a filthy demise: Big Big Body Wipes. Repetition to be taken seriously - these wipes are really rather large - each scales a magnificent 4ft x 2ft. It seems sanitisation is back and bigger than ever. This ginormous pack features two delightfully moist oversized wipes - the perfect way to keep the grub at bay - they’re an essential for all your camping, festival, travelling and sporting adventures. These guys are a total wipe out. Now go on, scrub up. Big Big Body Wipes come in packs of 2. Sanitation party!